OK, ‘sacred’ might be a bit mystical, but think about it – we’re social creatures, and we’re practicing our fullest expression of being human when we’re engaging with others. Whether it’s exchanging tips, ideas, or gossip, the ability to share ourselves with another person is what being alive is all about. People refuse to have their space violated at that most fundamental level – where conversations happen – and the current online version of that space is Twitter. It’s one thing to be marketed to when you’re in a car and you pass a billboard, or when you go to the store and are bombarded by brands, or when you’re watching TV and a commercial comes on (it’s actually a welcome snack/bathroom break). But it’s another when you’re in the middle of a conversation. Monetizing Facebook is a little different, because the communication that’s facilitated there is often asynchronous. When you’re commenting on a friend’s status update or scrolling through their photos from last night, you’re not directly interacting with them. Your user behavior is essentially “browsing,” so seeing an ad off to the side feels slightly less offensive. In a sense, it’s like window shopping or trying on stuff at the mall; you’re kind of checking things out, but not fully committed. You expect to see advertising, but mostly ignore it anyway. But then you swing by the food court with your shopping buddy, grab a bite, and decide to shoot the breeze for a bit. At that point – you’re engaged. You’re communicating with another person. If someone comes up to you mid-conversation and tries to sell you something, your resulting emotion will probably be anger or incredulity about the interruption. So if Facebook is the mall, Twitter is the food court. It’s different. It’s real-time. Sure, you still browse information that’s slightly dated (when scrolling through someone’s tweetstream), but for the most part, you’re watching people’s thoughts around the world manifest in real time. You’re talking to them. Exchanging links, stories, ideas. You’re learning, sharing, BEING HUMAN. It’s a global conversation arena, where we’re beginning to understand each other, build empathy, gain insights, and create new solutions. Are you ok with being marketed to in that space? Second point – you’re probably aware that for the current price of free, you are already able to advertise on Twitter. Unfortunately, it’s not as easy as paying money to be able to slap up an ad that will appear on my sidebar. (I’d ignore it anyway) You have to actually ENGAGE with your potential customers. And that takes time and effort. If you’re currently using your account as a broadcast channel – pushing ads instead of having conversations – you’re missing the point. You have the opportunity to attend “the world’s largest cocktail party,” and build trust, meaning, and value through consistent interaction with your audience. In turn, they will recommend you, retweet you, and your presence will have network effects. But that means you have to actually prove your worth and start building relationships by being honest, open, and helpful. It requires you to stop being a corporate entity and start being a human. Ultimately, the game has changed. Each of us is a node in the network now, with our own capacity to reach and influence, and to make (or break) connections at will. Your ability to impact others is a measure of the value you bring them, not the size of the ad you thrust in their face. 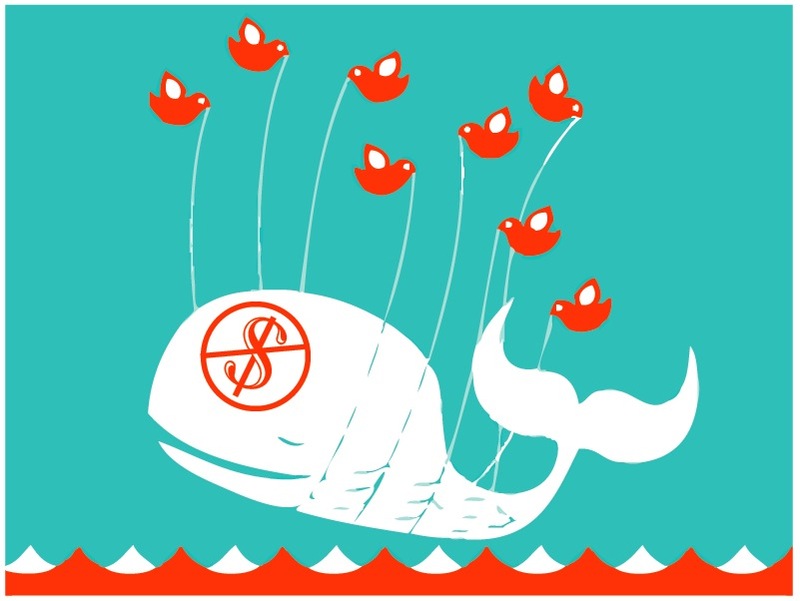 so how will Twitter monetize? I have no idea. The problem is that Twitter is a conversation, and trying to monetize conversations is hitting just a little too close to home. Whatever business model they devise, it’s going to have to be something innovative – because as soon as they introduce advertising, someone will just build the next Twitter, ad-free, and we’ll all go there. I agree with much of what you said, particularly that Twitter users will be upset if advertisements interfere with their conversations. That is why I’m not optimistic that ‘in stream’ ads (e.g. ad.ly) will succeed. But Google has found a way to make ads inconspicuous enough and useful enough that most people don’t seem to mind them, and that advertisers find effective. Are there reasons why you think such an approach to Twitter advertising is doomed to fail? why couldn’t cocacola just tweet that from their currently free account? if it’s giving people a $1 discount, wouldn’t people want to share that with their network, and retweet it & tag it with #coke #movies #coupon or something? Yes – Coke could tweet a discount using their own free Twitter account, but you’d have to be a follower of that account to see it. As I understand it, in Scoble’s model Coke would pay to load the meta-data of someone else’s tweet (perhaps one mentioning a hit movie) with their ad or coupon. In this way, anyone reading tweets about Avatar (for example) in anticipation of seeing it that night would see Coke’s coupon and be more inclined to buy Coke when they go. At least that seems to be the theory. – allow some more axis for personalisation (action preference, filtering by ad type) enriching the whole widgetosphere. But I’m not sure it’s the best idea for twitter. * the first on the experience of the stream, and the consensus that twitter is a great activity stream. That consensus is very true, fickle & twitter success is based on not defending it too much (at least not closely as fiercely as Facebook’s) — so I’d recommend experimenting with it, if only to give some code to Scoble to play with, but moderately (opt-in, etc. ), but I’m expecting Facebook to do a killing with those. We don’t see much socially targeted ads in France, but the one I saw was great: a chick flick was opening the next week, and it tried to leverage the stream to help posses coordinate to see it, sell advance tickets, inflate the first week figures, have a few boys stir up some controversies, and probably try to have stats to convince a star to come along as a surprise guest at the local Première. * the second is the social graph. That one is harder to copy & leverage, so I’d expect twitter to be better at this one, especially if it coordinates with url-shorteners and hires a few socio-semantic graph experts. >>Twitter is the food court…you’re watching people’s thoughts around the world manifest in real time… It’s a global conversation arena, where we’re beginning to understand each other, build empathy, gain insights, and create new solutions. Are you ok with being marketed to in that space? We are being marketed to in the food court space – by Panera, Burger King, et al – and paying for the space via what we opt there to buy. – see offers by potential solution providers (SourceForge, Samasource, Crowdflower, Rentacoder, Elance, Mechanical Turk et al) to implement the solution. This is a personal choice, but I would also be glad to pay for faster ways to find valued material in “fast food” quick scans of Tweetstreams or “slow food” of deeper exchanges on blogs. – their current ideas->action priorities (including requests for help on their existing projects, or description of standing offers to help others in kindred activities). I’d be more than happy to pay Twitter – or third parties — to autocreate basic Mindmaps based on my Tweet cloud that I could edit and tune for these purposes, so that more delightful Food Court conversations can happen – and can lead more surely to results. maybe the food court analogy didn’t work…. maybe a clearer example would be – when you’re sitting on one of those little couches in a nook in the mall somewhere & in the middle of a conversation, if someone walked up to you and started trying to sell you something, you’d probably be offended. re: #2 – visual mapping – have you seen http://oneforty.com/? there are so many new twitter tools coming out all the time, free, it seems a matter of time btfore someone would build something that could do what you’re describing. maybe they could have a service that you could pay to embed those tools directly on your twitter page, instead of having to goto oneforty.com to access that info, so you basically have a customized experience. or maybe it’s all going the way of virtual goods – maybe twitter will start having birthday cakes & champagne bottles that we gift to each other, like on facebook……. >>ideas to action – can you give me an example? Sure, I’ll be glad to try. Here’s how an ideas->action opportunity might work for university students in Sri Lanka, Haiti, Somaliland, and Kenya. Let’s say they want a way to build global visibility so that they can compete on the basis of reputation rather than giveaway pricing in global freelance markets for telework. Their conversation converges on a possible solution – a web site where they can volunteer to do work-study research projects for, or virtual internships with, highly-regarded bloggers. At this point, the marketing opportunities for Twitter could arise. Once participants posted a “RTa” (RequestToAct) for help in designing the web site, Twitter might respond with unobtrusive ads that linked to apps or solution providers for building a detailed spec. Participants in the project could then debate (with Debategraph) and vote (with various Twitter or other polling apps) to choose the best proposed spec for their site. At this stage, another RTa could signal their readiness to post the spec in online telework markets and/or SourceForge/Facebook/Ning volunteer communities, as a means of finding solution partners to build the site to their spec. This would move would enable Twitter to show ads for the related markets and communities, and/or to potential sites — such as GlobalGiving and Pledgebank — to find supporters to help fund the project. Such a global ideas->action system would bring Twitter new revenues from context-sensitive marketing. Rather than intrude on a free flowing conversation, it would providing paths to implement solutions when participants in the conversation signalled they were looking to move beyond discussion into action. Does this make the ideas->action opportunity clearer? Look forward to a conversation on how it can be improved, and get ready to go beyond the drawing board. Food court sounds like a very US-based analogy to me—that’s the problem with soft, social metaphors. i agree, a poor choice. Twitter is a conversation arena, but that’s a higher level function. Beneath the surface Twitter is an attention network. I give and get attention and once that attention is there I can engage in conversation. Companies who’s life and blood is social media, typically startups founded in the past few years, realize this and market their products or services following this process: 1) give relevant content to your audience/user base 2) draw attention 3) build a reputation 4) release subtle ads 5) start from 1). There’s no need to worry about these in-stream ads being intrusive. But the rest of the companies out there not fully able (or willing) to grasp the essence of social marketing need presence in social media nevertheless. They can’t build the same kind of community and engage in equally meaningful conversations, so, they need a solution with which they can just “jump into” existing ones. I agree that this is a very sensitive spot. But this is where the responsibility of general in-stream advertising platforms come into play. It is their burden to guarantee that the ads I tweet to my followers are as relevant to them as my own tweets. Even if platforms such as http://ad.ly or http://mylikes.com can’t do this right now I think their efforts definitely point into this direction. i agree with your 1-5 process, but i’m not sure about the next paragraph, where you say they “need a solution with which they can just “jump into” existing [communities]”. i don’t think potential customers will go for it, and so they won’t see any financially positive results from the advertising, and then will stop paying for the advertising. i think those companies that “are not fully able (or willing) to grasp the essence of social marketing” will eventually have no choice – they’re gonna have to figure it out. I agree with you when saying “the domain where conversations happen is sacred”, but is Twitter reducible to that domain? Isn’t it rather a meta-domain, where many conversations take place, every one creating its own domain, and where gaps are emergent? I see conversations as a matter of focus, and quasi-immediacy helps keeping a high focus level. But it also allows for some kind of tunnel effect, where we don’t see what we don’t want to see, whether it be advertising or conversations we don’t want to get involved in (and there are numerous on Twitter. http://bit.ly/d5VLhY Do you care about those people, or about their discourse, which is already mainly advertising in disguise?). Gaps are another interesting aspect of Twitter as a system. The new Seesmic design comes to my mind, where the “physical” space surrounding conversations can be harnessed to support advertising. I also remember the times when, in France and maybe elsewhere, the talking clock number was used as a rudimentary vocal network. People held conversations between time announcements, giving a totally different signification to the vocal service. I really don’t know where Twitter is heading to while trying to monetize, but am not sure either about what would kill, or not, the conversation. well, as you said, ‘we don’t see what we don’t want to see, whether it be advertising or conversations’ – that’s my point. if they introduce any kind of traditional advertising, like ads on sidebar or tweets in my stream, we’ll just ignore them. if everyone just ignores them, the companies that were paying for them will stop paying for them, because they won’t be bringing them any revenue. and so maybe it would be a very short-term fix for twitter, but eventually i think it wouldn’t work, because people are more interested in being ‘advertised to’ by people they trust (a friend making a recommendation or referral, or a business twitter account that is run by a real person who will engage with you – i think of @craignewmark of Craigslist or @ScottMonty of Ford Motors) than by a dead advertisement with no human behind it. Ignoring advertising is anything but what advertisers want, great point. In this scenario, we will ignore them because we are there to engage in conversations. But think about the insane number of “inactive” Twitter accounts, those people who don’t follow and don’t engage. Are they really inactive, or are they just sitting there, lurking and… maybe clicking to follow links? If this is the case, there is still a lot of room left for effective advertising. BTW, Twitter is the only service where we talk about inactive users. There is no such a thing for Facebook, MySpace, Orkut,etc. Why? Because inactivity is a subjective matter, and when Twitter choses to monetize, we won’t be able to access such data anymore. “Inactive” user are still monetizable accounts. Gaps is quite a similar subject. I am not sure alas about the correct translation (forgive my sometimes insufficient English). By talking clock number, I refer to the phone number you dial to get a recorded voice to give you the exact time, twice a minute. Conversations were sparkling there in between, the fact that they were interrupted twice a minute didn’t really matter, as it was such a funny place to talk with other people, and you also could unconsciously grab the exact time it was, in the space between conversations. Twitter is more a protocol than a network, and multiple channels are already operating there, most are conversations, but not all. I refer to those other channels as “gaps”. I think notably about those experiments which allow a plant to tweet whenever it is thirsty. Stowe Boyd’s microsyntax experiments are hardly readable too. Why wouldn’t advertising become a different channel, where we could dive in on an opt-in basis? These are only random thoughts, of course. But the world we live in is no more a linear predictable one, traditional and digital marketing techniques do not apply here anymore, as you in fact underlined in your post. Exploring new tracks beyond engagement and eyeballs might be required. The Twitter section is particularly applicable. Great thoughts! I wonder how the model changes when twitter is changed from a “conversation environment” to a service provider model. Recently it has occurred to me that twitter is effectively an infrastructure entity providing access to a developed network/service. It has created an ecosystem of users that enjoy it’s service and of developers that have created uses for the information like Ubertwitter and Tweetdeck. Some of these developers are already making money by embedding ads in their clients others are harvesting data and selling it to marketing firms to establish trends. Has this already been covered or am I missing something? Venessa, enjoyed the read as always — made me think :-). I will start off by saying that I think Twitter making money is a totally different subject than if advertising will work on Twitter. I don’t have an answer today, but it is possible for Twitter to make money by some future integration with business (who knows, maybe for some corporate needs) outside of the advertising world. Regarding space, agree that on Twitter space is a bit more ‘sacred’ than on facebook. Also agree that if I am having a conversation with someone and am interrupted by a sales person, then I would politely tell them to get lost. However, I do believe that advertising and promotions can happen on Twitter if set up correctly. Product promotions are happening today (and successfully so) and I don’t think it bothers anyone. A classic example would be @Delloutlet that already has generated over $3 million in revenue directly attributable to Twitter (and their tweets are promotions – “Looking for a good deal on a monitor? Dell Outlet has 20” HD flat panels starting as low as $99! http://bit.ly/amv8r7. Limited time offer!”). There are other aspects of twitter like cost saving from customer support(@homedepot, @wholefoods) and revenue from increased brand recognition ( @zappos, @woot) that also will play a role if Twitter were to make money. The reason I brought out these examples is because for Twitter to make money, first the firms have to ‘make money’ through their Twitter efforts. Now specific to advertising, I definitely don’t want unsolicited ads stuck between my tweets or my twitter page cluttered with sidebar ads. However, I do think as is today with @delloutlet etc., maybe there can be an opt-in mode which will have advertising. Alternatively, Twitter could leverage upcoming aspects like Google’s social search. Create a structure (of course, there are various details to be thought through) where there can be some sort of customer opt-in and a bank of ads which will be served as part of the search results. Yet another way will be to use some sort of triggers (use of a certain hastag or something like that) that when used will bring back results with ads. Or to the point made earlier, maybe they can monetize certain customization aspects of the value-chain. My thoughts… if we look at the structure of how “making money” through online advertising has evolved over the past ten years we will see the number one factor has always been from affiliation. Thus, twitter could possibly crate their own affiliate program based on the links that are shared by twitter uses where in turn they get a commission from that sale. the rules for advertizing in a realtime format are in my view very different to the curated one.